Katok Tsewang Norbu (Wyl. 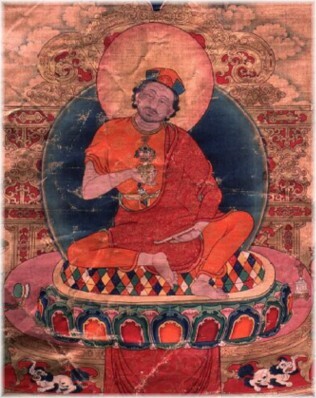 kaḥ thog tshe dbang nor bu) (1698-1755) — a great master of the 18th century whom E. Gene Smith has called "perhaps the most original mind ever to appear in the Tibetan tradition." He was born in the Sangan area of Kham and studied at Katok Monastery. He travelled to Central Tibet where he met all of the great masters of his day, including teachers of the Jonang tradition. He was a close friend of Situ Panchen and engaged in a lively correspondence with intellectuals like the Mongol Gung Gombojab. His collected writings include historical works, copies of 8th and 9th century inscriptions, and ritual texts. He served the Tibetan government as an emissary and peace maker among the warring princes of Ladakh. He was active in the restoration of the Swayambhunath Stupa in Nepal. He was a proponent of the Shentong approach and wrote several works on this and also on the Kalachakra Tantra. According to the Dalai Lama, the true reincarnation of Katok Rigdzin Tsewang Norbu was the First Katok Getse, Gyurme Tsewang Chokdrup. This page was last edited on 4 September 2017, at 17:42.